One of the greatest king-prophet relationships holds an inspiring message of hope. Two important archaeological artifacts made their world premiere in an exhibit at our offices in Edmond, Oklahoma, on June 10. 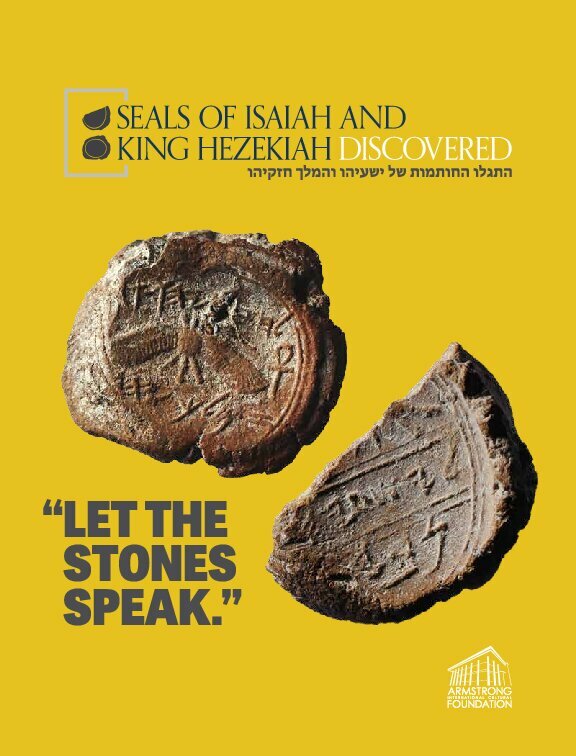 The exhibit, called “Seals of Isaiah and King Hezekiah Discovered,” features two clay bullae, definitive archaeological proof, of King Hezekiah and what we believe is Isaiah the prophet, discovered in Jerusalem just south of the Temple Mount. It also has 36 other artifacts from the period in ancient Israel during which these two men lived. We are excited to host this electrifying proof of the Bible’s veracity. For the premiere event, we connected by a live feed to the King David Hotel in Jerusalem, Israel, where Deputy Minister in the Prime Minister’s Office Michael Oren and premier archaeologist Dr. Eilat Mazar spoke. In his address, Dr. Oren, who is also a noted historian, spoke on the controversy within archaeology—what various artifacts mean, what they tell us about history, and to whom this is important. Yet I believe there is an archaeological principle that, if it were followed, would unify the archaeological community. Fifty years ago, Herbert W. Armstrong, the namesake of our college, began a wonderful partnership with Prof. Benjamin Mazar. They started working together on archaeological projects in 1968. I was there and always supported Mr. Armstrong’s efforts in Jerusalem. I was truly excited about those projects. The more you dig into the Bible, the more your excitement for digging in Jerusalem will grow. We have continued this “iron bridge” partnership with Professor Mazar’s granddaughter, Dr. Eilat Mazar. 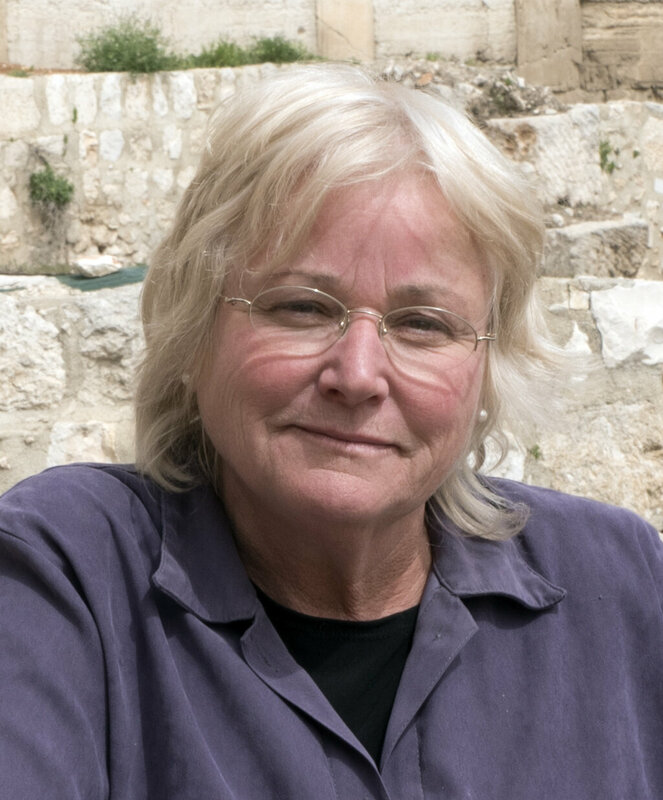 Eilat has repeatedly said that when digging we need to “let the stones speak”—allow the discoveries to provide the evidence of their historical context. I truly believe if everyone would follow this principle, it would remove most of the controversy and unify us. Dr. Mazar and I do have different views and different religious beliefs. Today, I want to give you my view on this subject: let the stones of King Hezekiah and Isaiah speak. The more I have looked into this, the more inspired and filled with hope I have become. What makes these two clay seals more fascinating than other archaeological finds is that they represent a remarkable king-prophet relationship. These two men were working together in the greatest king-prophet partnership since King David and Samuel. Finding those seals in the same strata of soil—from the same historical period and within a few meters of each other—highlights how closely these men worked with one another. There is a controversy surrounding the seal of Isaiah, whether it belonged to the prophet or some other personality. I believe when you look at the weight of evidence concerning Isaiah the prophet, it should not be taken any other way. (We, along with Dr. Mazar, have written at length concerning this topic.) There are 16 biblical verses where King Hezekiah and the Prophet Isaiah are mentioned together. The fact that these artifacts were found so close to one another is perfectly consistent with the Bible’s account of their relationship. 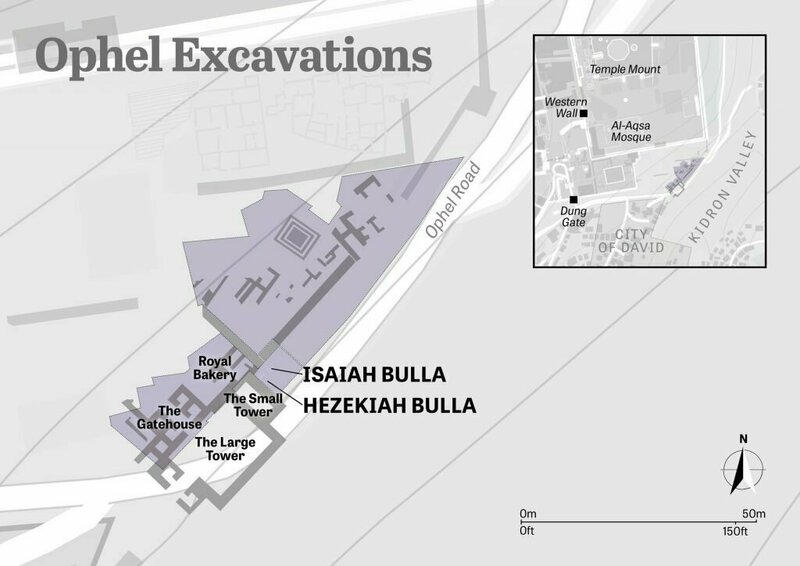 Location of the Hezekiah and Isaiah seal impressions. King Hezekiah is considered one of the most righteous kings to rule Judah since the time of David. “And he [Hezekiah] did that which was right in the sight of the Lord, according to all that David his father had done” (2 Chronicles 29:2). Hezekiah went in and cleansed the temple Solomon had built. He restored the priests and Levites to their God-ordained duties. He reestablished the message of God in Judah. Under his leadership, most of the nation was turning away from its idolatry and toward God. But a great crisis was right on Judah’s doorstep: the Assyrian army. Hezekiah had weaknesses, just like any one of us. And from some of the artifacts that have been discovered from his reign, we can see that he had a relationship with Egypt. He pursued an alliance with the Egyptians in an effort to keep Sennacherib, the leader of Assyria, out of Judah. The Prophet Isaiah had warned Hezekiah against this course. But he didn’t listen to God’s man at that time. God was unhappy with what Hezekiah was doing. As correction, He allowed Sennacherib and his giant army to march into Judah and conquer 46 powerfully fortified cities! This was deeply alarming to Hezekiah. But once again, rather than looking to God and His prophet, Hezekiah went to the temple, stripped it of its gold and silver, and paid Sennacherib tribute. He hoped he could buy protection by looking to a man—a monumental mistake. This tribute only encouraged Sennacherib to redirect his attack on Jerusalem. He sent a letter to Hezekiah proclaiming that after attacking Egypt, he would return to Jerusalem. In it, Sennacherib made fun of and taunted the great God—all to his deep shame! At last, Hezekiah chose a different response. “And Hezekiah received the letter of the hand of the messengers, and read it: and Hezekiah went up into the house of the Lord, and spread it before the Lord” (2 Kings 19:14). In the temple, Hezekiah cried out to God. He was no longer going to rely on men or wealth for protection. He started looking to God. And amazing things began to happen. God heard Hezekiah’s prayer, and sent Isaiah to him with a message. The king and prophet were now working together. Isaiah said, “Therefore thus saith the Lord concerning the king of Assyria, He shall not come into this city, nor shoot an arrow there, nor come before it with shield, nor cast a bank against it. By the way that he came, by the same shall he return, and shall not come into this city, saith the Lord. For I will defend this city, to save it, for mine own sake, and for my servant David’s sake” (verses 32-34). Sennacherib’s army eventually besieged Jerusalem. One hundred eighty-five thousand soldiers surrounded the city. No one could enter, and no one could leave. The city was ready to die. But God fulfilled what He had promised. When the watchmen inside the city woke up one morning, they saw that Sennacherib’s giant army, all 185,000 men, were dead! God had sent an angel to destroy an entire army! God protected Jerusalem in a miraculous way for David’s sake and for His own sake! After his whole army was miraculously killed, Sennacherib returned to Nineveh. He had been deeply humiliated. But he still recorded his conquest of 46 cities. This great Gentile king had conquered Lachish, Judah’s second-greatest city. He recorded that event on wall reliefs in his palace in Nineveh. He was so proud of his accomplishments. He boasted that he “shut [Hezekiah] up like a caged bird in his royal city of Jerusalem.” And that is where history’s secular record ends. Through artifacts like the Taylor Prism and Lachish wall reliefs, Sennacherib documented his successful conquests. But regarding Jerusalem, he failed to document the one night that changed everything—for that city, for Judah and for the Assyrian superpower. Some time after his return, two of his sons murdered him and then fled to Armenia. Another son eventually became the king of Assyria. Why do you think his sons killed him? Do you suppose it had to do with this stunning defeat—the fact that in one night the Assyrian army was completely wiped out by an angel of God? You can’t always trust history and the documentation of men. But you can always trust the true history of the Bible. This is a hard lesson for mankind to learn. I have looked at the story of Sennacherib from the angle of secular documents and biblical records, and every time I read what the Bible says, I’m more and more impressed, moved and galvanized to action! And two important figures at the center of this remarkable history left seals in the dust of Jerusalem! When you look at the seal of King Hezekiah, you have to ask why he created a seal depicting a sun with two downturned wings? 2 Kings 20 tells us that around the time of Assyria’s conquests, Hezekiah was “sick unto death.” God was really testing and trying this king. Humbled by his illness, Hezekiah delivered a heartfelt and tearful prayer to God. God then told Isaiah, “Turn again, and tell Hezekiah the captain of my people, Thus saith the Lord, the God of David thy father, I have heard thy prayer, I have seen thy tears: behold, I will heal thee: on the third day thou shalt go up unto the house of the Lord. And I will add unto thy days fifteen years; and I will deliver thee and this city out of the hand of the king of Assyria; and I will defend this city for mine own sake, and for my servant David’s sake” (verses 5-6). After receiving this promise, Hezekiah asked for a sign as proof that God would heal him. He was given the option to see the sun move either forward or backward. Hezekiah knew that the sun moves forward every day, so he wanted it moved back. And that’s exactly what God did! The shadow on the sun dial moved backward 10 degrees. The sun moved backward as a sign to this great king that God would not only heal him, but He would also heal Jerusalem and all of Judah! God added 15 years to Hezekiah’s life. This is a powerful part of this history! The wings on Hezekiah’s bulla represent God’s healing and protection. This is symbolism found throughout the Bible. Psalm 84:11 says that “God is a sun and shield”; Psalm 91:4 says we can take refuge under God’s wings; Ezekiel 16:8 says God will cover us with protection. These verses explain why Hezekiah would use such symbolism on his royal seal. The Bible interprets its own symbolism. “But unto you that fear my name shall the Sun of righteousness arise with healing in his wings; and ye shall go forth, and grow up as calves of the stall” (Malachi 4:2). This is essentially the same symbolism on Hezekiah’s seal. Let the stone of Hezekiah speak! This verse speaks with a thunderous voice today! God healed Hezekiah and the whole nation! That bulla is an impressive reminder of God’s protection. What a wonderful promise from God that He will “arise with healing in his wings.” What a miraculous healing! Our faith can grow weak, just like Hezekiah’s did. We are subject to sin, just like one of Judah’s greatest kings. But Hezekiah really knew how to turn things around. What an inspiring story that is! Dr. Mazar has said that the design for Hezekiah’s bulla was created after the invasion of Assyria. Why would Hezekiah choose this design for his bulla? He wants us to remember this miraculous history. We are talking about miracles that are shaking the universe! I don’t know how anyone could not be deeply moved by this marvelous truth. King Hezekiah worked very closely with one of the Bible’s greatest prophets. Isaiah had a powerful warning for Judah in his book. But he did not write this message for his day. God instructed him, “Now go, write it before them in a table, and note it in a book, that it may be for the time to come for ever and ever” (Isaiah 30:8). This verse is referring to the latter days—the age leading into the Messiah’s coming. Many other scriptures show that this is the time we live in today! In his book, Isaiah took pains to record the entire history of Hezekiah, which is also recorded in 2 Kings. Why would he do that? It is because that history is relevant for our time!We are living in the latter days. God wants us to go back to that example and learn some of the greatest lessons in the Bible. If you truly believe the Bible, then you can understand some powerful lessons from it. The world is growing very dangerous. Whether or not people realize it, threats like powerful foreign armies are rising. The example of Hezekiah and Isaiah working together shows how such threats can be overcome! This combination is one of the Bible’s most powerful examples of a king working with a prophet. They give us an astounding example of the kind of miracles that can come from such a partnership! What does God mean when He says He will “plant the heavens”? Many verses show that He is going to beautify the whole universe! He will cause the Earth to blossom like a rose, and then He will expand that beauty out into the cosmos! Isaiah 9:7 says that “of the increase of [God’s] government and peace there shall be no end”—forever! God is planning for that future right now. You can be a part of it. You can see why God wants to keep the vision of Hezekiah and Isaiah alive. Let the stones of Hezekiah and Isaiah speak. The history they represent is awe-inspiring if we truly believe it. Those stones have a thundering voice of hope for any age—but especially for the time we live in today!